Highly interactive show that's part stand-up, part actual pub quiz. Expand your trivia, compete against other teams, win prizes. Returning for fifth year; this year’s theme is the 90s. Sold out 2016-2017 at the Edinburgh Fringe. 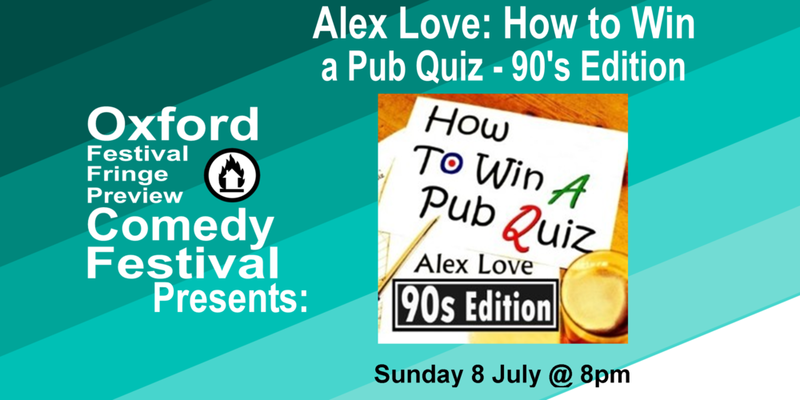 ‘Alex Love is a confident and relaxed performer who makes his audience feel at ease... Whether winners or losers, everyone left happy’ **** (BroadwayBaby.com). ‘That the energy and humour are maintained throughout is testament to Love's ability to work an audience. A brilliantly fun show packed full of running gags and ad-libs’ (DenofGeek.com). **** (One4Review.co.uk).